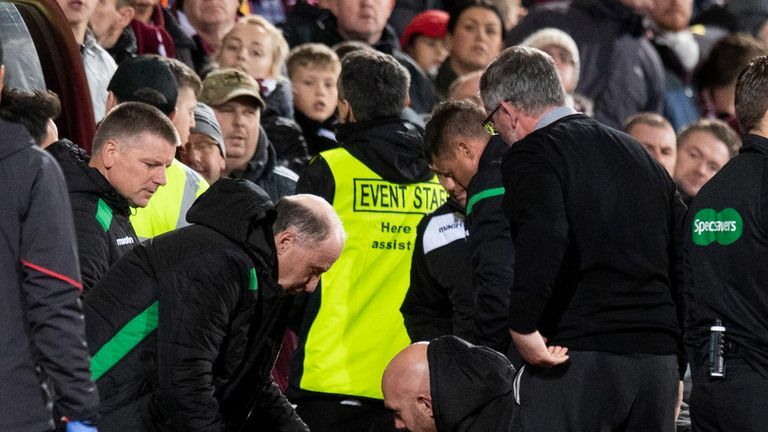 Hibernian head coach Neil Lennon and Hearts goalkeeper Zdenek Zlamal were both floored by foreign objects during a chaotic and goalless Edinburgh derby. Zlamal was quickly able to continue after the latest in a series of flashpoints moments after Florian Kamberi received a second yellow card in the 65th minute following a mass confrontation that saw angry scenes in the technical area as well as on the Tynecastle pitch. 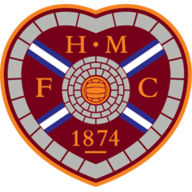 Both teams were missing players due to an array of injuries, but Hearts started the game on the front foot with Olly Lee forcing a save from distance and Dikamona coming close from an ambitious overhead kick. But Darren McGregor missed a better chance at the other end when he could not turn a free header on target from a deep corner. Stevie Mallan then took centre stage with a series of wonderful long-range efforts. 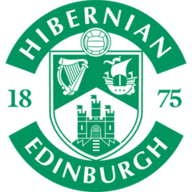 The Hibs midfielder hit the bar from 30 yards, shaved the top of the goal from a free-kick and then forced Zlamal to scramble the ball wide after aiming a free-kick from near the touchline inside the near post while everyone else anticipated a cross. Hearts also enjoyed the better of the opening stages of the second half but Mallan forced the first save after running on to Martin Boyle's square ball. The game exploded into action after the hour-mark. Martin Boyle escaped with a yellow card after pushing Michael Smith three times following an off-the-ball clash which also saw the Hearts full-back booked. A more widespread melee soon followed after Kamberi was penalised for an aerial challenge on Oliver Bozanic. Ben Garuccio reacted particularly angrily and both he and the Swiss striker were booked - the latter paying a heftier price after being yellow-carded for what looked an innocuous aerial challenge in the first half. Moments later, after tackles flew in from both sides, Zlamal was floored by what appeared to be an away fan attempting to make contact with the goalkeeper as he fetched the ball from behind the goal. Hearts struggled to press home their numerical advantage but Dikamona hit the edge of the bar in the last minute following a corner before guiding a backwards header into the net after Adam Bogdan had got caught out following another corner. But with the keeper well off his line, Dikamona was ruled to be offside, sparking the latest attack on Lennon at Tynecastle.